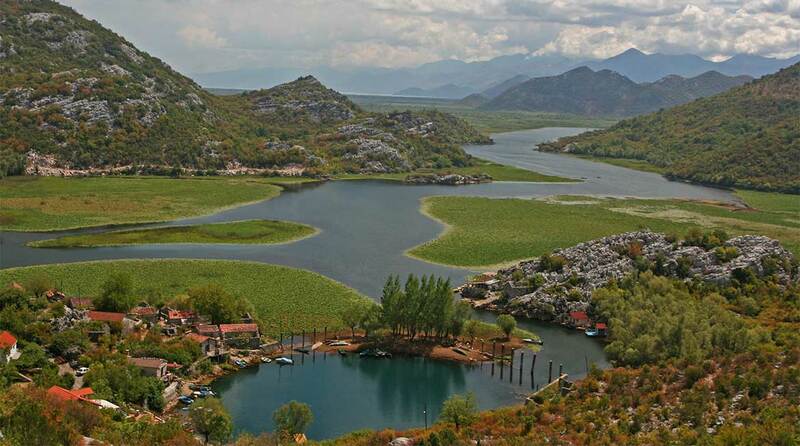 Named after the city of Shkodra in northern Albania, Skadarsko Jezero also known as Lake Skadar is the largest lake on the Balkan Peninsula and with its surrounding wetlands it encompasses one of the most important bird and fish habitats in the Mediterranean region. About 62 percent of the lake lies in Montenegro and the rest in Albania. Home to several species of fish and birds, Skadarsko Jezero is a critical wintering and staging site for migratory birds and European waterfowl and the western most nesting site for the rare and elegant curly or Dalmatian pelican; in all, more than 280 species of birds have been recorded here, as well as 50 species of fish. Skadarsko Jezero is largely fed by rivers, springs and underground watercourses and is connected to the Adriatic Sea by the River Bojana. Its catchment area is nearly 5.500 square kilometers – mainly Montenegrin territory. One of the main characteristics of Skadarsko Jezero is the seasonal variability of its water level due to inflow from the Moraca River, combined with the limited capacity of the Bojana River to discharge into the Adriatic. Skadarsko Jezero is one of the last nesting habitats for many bird species, of which pelicans have been chosen as the symbol of the lake. 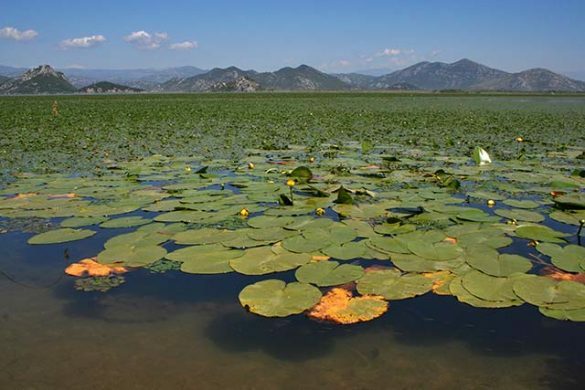 The Montenegrin part of Skadar and its surrounding area were declared a National Park in 1983, got the Important Bird Area status in 1989 and in 1996 it was included in the Ramsar list of wetlands of global importance. 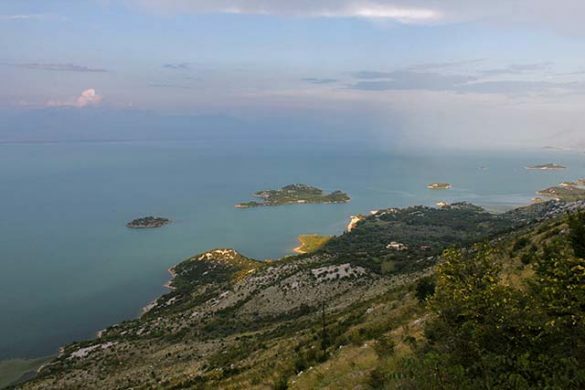 The Albanian section won Nature-Management Reserve and Ramsar status in 2005. Spring and autumn rainfall floods the northern banks, greatly increasing the range of habitats for lake organisms and providing extensive spawning and feeding areas for fish and birds. It’s exactly the variation in water levels that gives the lake its unique characteristics and led to its Ramsar status – including extensive willow groves, reed beds and floating vegetation. Skadarsko Jezero has a long, proud history. Once part of the ancient Slav province of Zeta, it was invaded by the Turks in the 13th century and occupied for five centuries with many battles witnessed by now crumbling fortresses such as Besac in Virpazar and Lessendro in Vranjina. 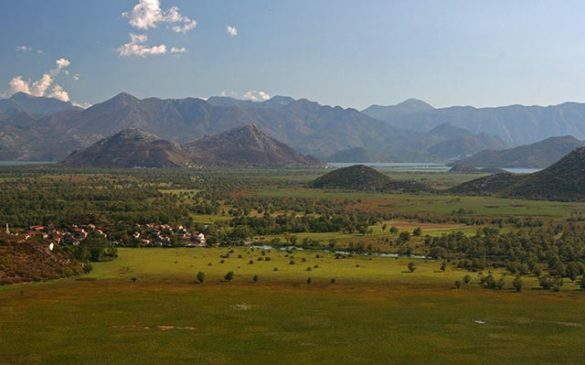 When the Turks were expelled from Montenegro in the late 19th century, Skadar town itself (once the capital of Zeta) was incorporated into Albania and is also called Shkoder. Meanwhile several Albanian villages on the southern shores such as Ostros and Donji-Murići became part of Montenegro. 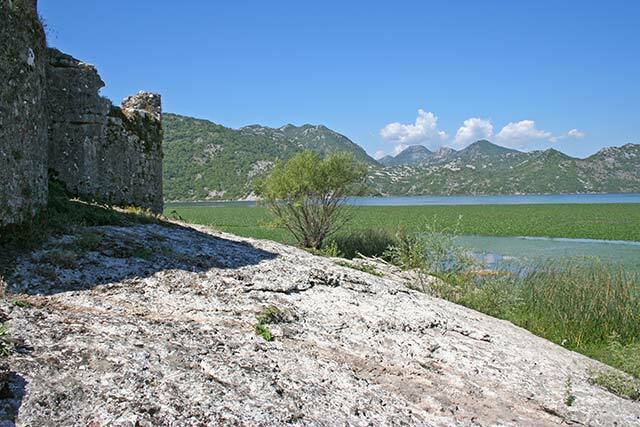 During the fighting days against the Ottomans, Montenegro’s rulers established their ruling seat and bastion in the north-west wetlands, at Žabljak Crnojevići, until they were forced to move their capital to Cetinje in 1482. By the 19th and early 20th century, with an Independent Montenegro, the lake returned to royal glory with King Nikola setting up his summer court at the attractive lake town of Rijeka Crnojevića. In WW2, Skadarsko Jezero made history again as Virpazar provided the scene of the first Partisan uprising in Montenegro. Large areas of the park are wetlands with floating plants, white and yellow water lilies, kasaronja, and reeds and rushes, which are an ideal habitat for many species of bird and fish. Endangered plant species grow on the Skadarsko Jezero, as well as Fritilaria gracilis, Crocus dalmaticus, Edraianthus tenuifolius, Ramondia Serbica. 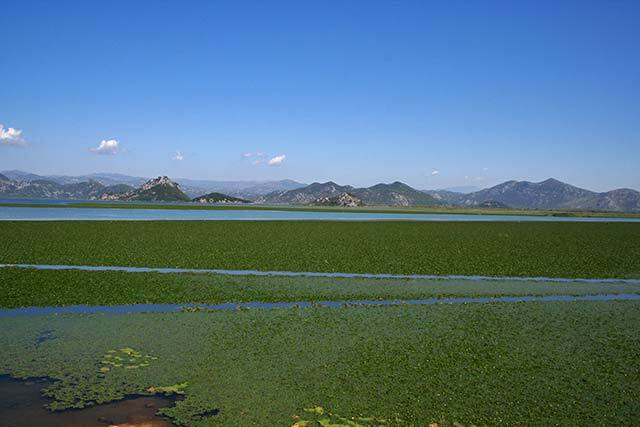 According to the latest research and studies, Skadarsko Jezero has 930 species of algae. The lake area is forested with an oak forest, bitter oak forest and white willow forests. Typical of the area is the community of Stipe salvietum. Willows spreading on water-flooded courts create more woods and forests. The whole Montenegro was lying in front of us like on a relief map. 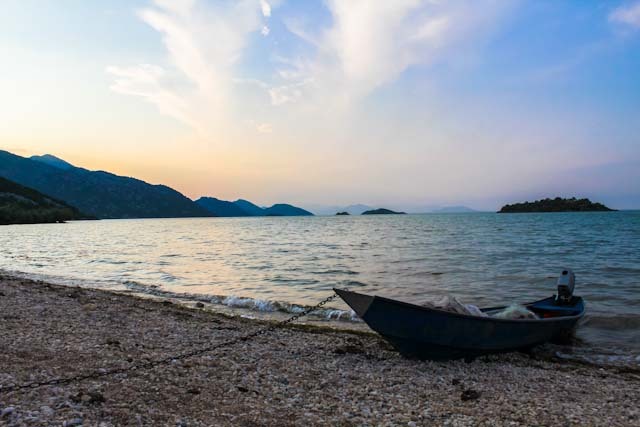 The sun was playing quietly with waves of Boka, the surface of the Skadar lake was glittering there, and the blue Adriatic was fading on the horizon. In the wild luxury, the Albanian Alps and the coastal mountain Rumija were rising. The eyes were roaming through enduring series of mountain chains and valleys, while in the background, the snowy crests of the Durmitor and Komovi mountains were sending their last regards. Podgorica was ascending from the green valley. I could not take my eyes off that beautiful sight. The Skadarsko Jezero changes its water two to three times a year, with the river Bojana going out to the sea. From the sea into the lake come different species of fish. The levels of the lake can be sometimes 60m lower than sea-level and it is therefore an ideal place for breeding, and with the average summer water temperature of 22 ° C and winter temperature almost never below 11 degrees, the lake is an ideal place for fish. The main fish are of the carp family (Cyprinidae), such as carp – Cyprinus carpio, bleak – Alburnus Alburnus, and a small endemic šaradan – Pachychilon pictum. Because of the large number of underwater springs, the lake also allows for salmonid fish: trout – Salmo trutta m. fario, lettuce – Salmo marmoratus, strings – Salmo farioides, and rainbow trout. With the proximity of the Adriatic Sea and its connections via the River Bojana, marine fish such as latch Mugil cephalus and M. ramada, Kubla – Alosa fallax nilotica, eel – Anguilla Anguilla can be found in the lake. Because a lot of fish, especially carp and bleak, live only inside these lake parts, the National Park has forbidden fishing during the breeding period. These areas are specially protected by the service of protection of the National Park. In the past, the demand for fish was very high which often caused conflict between the protection service and fishermen. Fish hide during the summer around the white and yellow water lily, and below the floating leaves of kasaronja (Trapa natans L). This type of floating leaves is edible, and its fruit is used by the locals. During the famine period in the 19th century, all fields of vegetables were destroyed and citizens survived feeding on the fruit of the kasaronja. Thanks to the preservation of its ecosystems, the Skadarsko Jezero has 280 bird species some of which are on the list of endangered species, such as the dalmation pelican and the black ibis, small white storks and the gray stork, the only species known to nest in laurel. Seventy three species are nest migrant species, 18 conventional migrants, 45 are winter visitors and 12 species spend the summer at the lake. An ornithological center is under construction in the area and the lake contains a number of towers and platforms built specifically for watching birds, located in the 5 biggest ornithological reserves: Manastirska tapija, Pancevo oko, Grmozur, Omar Gorica and Crni Žar. On the water-lily you can often see numerous egrets resting. Birds enjoy the lake because of its rich vegetation, but also for its safety as the National Park has forbidden any type of bird hunting within its boundaries. The Skadarsko Jezero is an important habitat for aquatic invertebrates. The most numerous are Rotatoria, Cladocera, Copepoda, Protozoa, Copepoda and Cladocera, the European freshwater crab – Telephus fluviatilis and shrimp – Palaemontes antennarius. Mollusc fauna is poor in diversity but rich in quantity, especially freshwater mussels and numerous aquatic snail populations, of which five are endemic. Aquatic insects are numerous and diverse: the most common are Trihoptere, Ephemeroptera, Plecoptera and Diptera. Terrestrial invertebrate fauna is represented by a large number of insects, among which there are lots of Mediterranean endemics (protected species): forest ant – Formica rufa, Swallowtail – Papilio machaon, Mediterranean Swallowtail – Papilio alexanor and Swallowtail – Papilio podalirius, stag beetle – Lucanus corvus and nosorožac – Oryctos nasicornis. Reptiles are also numerous, including snakes, marsh turtles, and Ophis aurus apodus lizards. Of particular interest is the amount of endemic lizards on the islands. The lake area contains the Skadar endangered green frog and many other amphibians such as high toad – Bufo bufo, Green Toadd – Bufo viridis, tree frog – Hyla arborea and common newts – Trituris vulgaris. The forested area is inhabited by ordinary or colorful salamander – Salamandra salamandra. The region is inhabited by about 50 species of mammals, including the water otter – Lutra lutra, which is protected by law. Other mammals belong to the terrestrial ecosystems, especially the forested areas, foxes, hares, numerous wild boar, squirrel, doormice, hedgehogs and moles. There is also the rare endemic Dinaric mouse and seven species of bats all endangered on a global level and protected by law. The climate is Mediterranean with long hot summers and a short cold winter made very wet by the mountainous nature of the region. With its 270 bird species, four bird-watching towers on Stanaj, Radus, Plavnica and Zabljacke and eight organized bird-watching tours offered by the National Park, Skadarsko Jezero is a real attraction for bird-watchers and nature lovers. 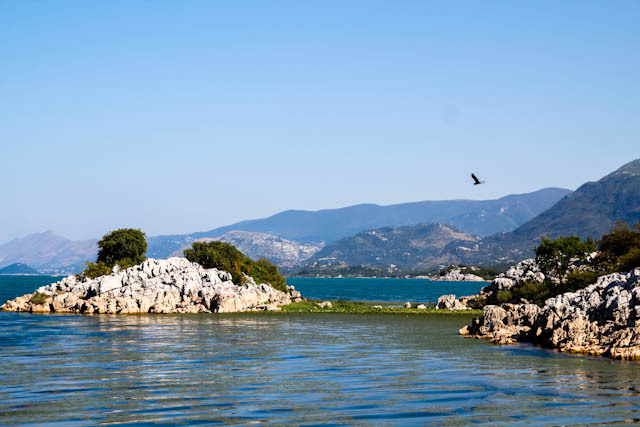 Skadarsko Jezero is also the habitat for the protected, rare curly pelican. Since 1995 it has been a designated Wetland of International Importance by the Ramsar Convention as a habitat for water birds. Especially interesting bird species are: Dalmatian Pelican colonies (Pelecanus crispus); the Pygmy Cormorant (Phalacrocorax pygmeus) (the biggest world colony of approximately 2000 bird pairs) ; the Whiskered Tern (Chlidonias hybridus); The Great Cormorant (Phalacrocorax carbo); the Ferruginous Duck (Aythya nyroca); the White-tailed Eagle (Haliaeetus albicilla); as well as several hundreds of Grey Heron (Ardea ralloides); There are five ornithological reserves at Skadar Lake: Manastirska tapija, Grmozur, Omerova gorica, Crni zar, Pancevo oko. This is a good destination for walkers, although not as challenging as Montenegro’s North, where the mountains are far higher. The National Park authorities have marked some paths and provided info-boards. Contact the visitor centre for more information. Marked routes available throughout the National Park and surrounding areas. A great 55km circular route is – Virpazar, Boljevici, Stari Bar, Ulcinj (overnight), Ostros, Murici, Godinje, Virpazar. Around the lake there are various interesting caves to visit including Obod, Grbocica, Bobosuta and Ispila. Easily arranged when you reach Virpazar and Rijeka Crnojevica. The lake is full of fish: carp, eel, trout, in total 40 species. It’s interesting that saltwater fish species can be found in Skadarsko Jezero. Carp is the most attractive species for fishermen. Carp get caught in both, deep and shallow waters, near stream and rivers estuaries, in cryptodepressions (Lake “oka”) and around lake isles. For bait they most used is corn seed or ball of paste with artificial smell and taste which is made for carp fishing (so called “boil” bait). 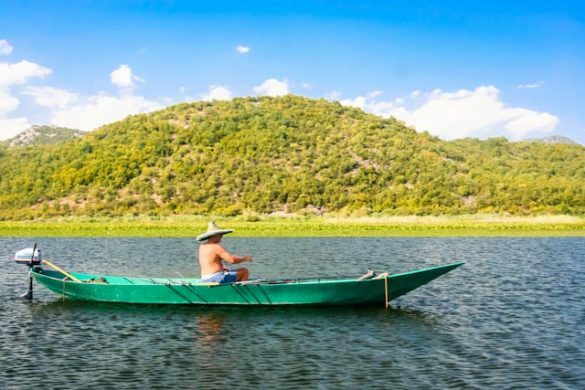 The fishing season on Skadar Lake lasts almost for whole year but there are some restrictions according to species. Fishing season for bleak is from 31st of October until 15th of March (four and a half months or 135 days of which 30% of the days are unfavourable for fishing so the real number of fishing days is 95), during bleak autumn migration to their wintering habitats and during bleak wintering in Lake “oka” (Lake cryptodepressions) and other deeper part of the lake under strong influence of fresh water with relatively constant temperature. In other part of the year fishing of bleak is forbidden. Carp and all other species fishing season is from 1st of June until 1st of March (fishing of carp and all other fish species is forbidden for three months, March, April and May during spawning period) and season last for 9 months or 270 days. During this period 30% of the days are unfavorable for fishing (heavy rains in autumn and winter followed by strong north wind during autumn, winter and first month of spring). So the real number of fishing days is around 190 days. The entrance fee for the park is 4 euro’s per person. This also applies immediately as entrance ticket for the Virpazar and Vranjina visitor centers. Fishing licenses are mandatory for fishing. Due to the size of the lake and the multiple roads that lead and pass through it, it is in practice that the park often is visited without payment. This without a single evil intention. If there are any questions, contact can be found with the visitor center in Vranjina, the eye-catching camels hills in the lake. Opening hours: during the summer tourist season, from 8-18 every day; Out of season: from 08 – 16 hours, from Monday to Friday. According to the laws governing national parks in Montenegro, in order to preserve the natural resources and cultural heritage of the parks, no new projects can be launched. Exception for this is only for existing foundations on which a new project can be realized. In relation to the other parks, the area of ​​the lake has always been more populated than in the other parks. In history, the lake has always been an important place for gathering food and then mostly fishing. Logically, there are therefore a small number of genuine traditional fishing villages on the banks of the lake. The only Montenegrin town on the lake is Virpazar, which, however, also has more away from a small size village. Due to the size of the lake there are three more famous big cities, all of which are remote from the lake. These are Cetinje, Bar and the capital of Podgorica itself. All about half an hour drive. What a good alternative could be due to the larger offer of accommodation. Virpazar itself, depending on the season, can also really lay on the banks of the lake. This is mainly in autumn and spring, where the water level is at its highest. This makes it an ideal place to discover the park. Many boat trips leave from Virpazar. Hotel Pelikan – The hotel and the fleet of boats for the hotel each have their own history, pervaded by a special atmosphere and the charm of the odžaklija, the authentic fireplace room typical for the traditional Montenegro household. Founded in 1960, Hotel Pelican forms part of Virpazar’s history. Facilities: Restaurant (à la carte), Terrace, Free Wi-Fi, Bike rental, Coffee bar, Ticketservice. Country House Djurisic – The story of Country House Djurisic begins at the Zabes estate. It is the estate of the Đurišić family, which has existed for more than 500 years in the Skadar lake area. The estate extends to 8000 m2 and there are an abundance of different plant species and especially vines, whose family produces 5 centuries of wine. For several years, the family has also started offering accommodation. All accommodation is air conditioned and has a seating area. Some feature a terrace and a balcony. Guests can also enjoy the on-site restaurant or take a look at one of the family’s wineries. Facilities : Restaurant, Terrace, Free Wi-Fi, Bike rental (Free), Garden, Barbeque facilities, Picknick area, Massage, Free parking, Breakfast options, Coffee bar. Guesthouse Feel Lake – Guesthouse Feel Lake is located in the peaceful historic village of Godinje. Located at a distance of 4 km from Virpazar. The village is located on the lake’s mountainous banks of the lake and is famous for its wine history. Even today, quality wines are being made on a small scale. All rooms have a private terrace or balcony. The rooms have a shared bathroom. Faciliteiten : Terrace, Free Wi-Fi, Tuin, Barbeque facilities , Breakfast options, Free parking, Pet’s allowed. By Train : Virpazar, the main settlement at the lake, has a train station on the Bar-Belgrade line operated by Serbian Railways, with several trains visiting daily. By Bus : You can also get to Virpazar by bus from Montenegro’s capital, Podgorica, or nearby coastal town Sutomore. Note that public transport is not available to reach other settlements around the lake, but there are tourist agencies in Virpazar who can arrange lifts for you. When using Cetinje as starting point there is the possibility to use the scenic way through Rijeka Crnojevica instead of the main road going to Podgorica and then to Virpazar. The route takes the 32 kilometer of local roads and is a beautiful alternative.